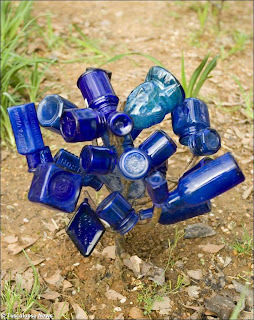 I tried to set up a photo montage of bottle trees... got it set up three times, but always had html error messages... so I've given up for the night... and, instead, I'll just post a few photos of bottle trees. These are not from my yard, though I wish they were... 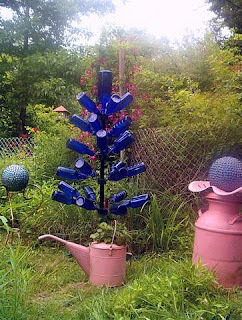 I've collected enough blue bottles to create a decent blue bottle tree which I hope to complete this summer. Gotta find just the right dead tree... or perhaps I'll have someone weld one for me. How delightful! 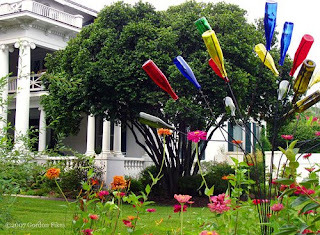 You told me about bottle trees before, but to see actual photos is wonderful. I don't think they would work in my area - too much wind. I would end up with a pile of glass shards on the ground.